The teenage Jon is a crappy magician. He attempts to entertain a band of drunken mercenaries (Sigvald, Blackthorn, Slagfinn and Gravit) but they hate his antics and attempt to kill him. The warrior Tomgar comes to his rescue and the two friends stride away, with the beaten mercenaries swearing to get even with Jon. Jon goes to visit his mentor, the wizard Zon, to ask for a sleeping potion. It’s Jon’s birthday and after he parties all day, he wants to make sure he can sleep all night. Zon gives him the sleeping potion plus an additional gift: A special potion that will give him the power to deal with any situation. He simply has to drink it and the potion will do the rest. Jon thanks Zon and leaves. Jon meets up with Tomgar, Erik and Sven at a tavern to celebrate his birthday. They each give him gifts: Erik gives him a volume from his little black book collection (just A to C), Tomgar gives him a sack of ninja weapons he pillaged from the Orient, and Sven gives him a specially prepared bowl of turtle soup. Jon likes the turtle soup so much that he mixes it with the potion Zon gave him to improve the flavor. Jon notices a fair wench named Glissandra and invites her to sit with him. Unfortunately, she’s only interested in the dashing Erik. Undeterred, Jon takes a drop of Zon’s potion, hoping it will make him extra charming. It knocks him out cold, instead (because he took the sleeping potion by mistake). As Tomgar takes him upstairs to sleep, the mercenaries look on and await their chance for revenge. As Tomgar sets Jon down, Gravit sneaks up on him and knocks him out. Jon wakes up in time to see the mercenaries do the same to Erik and Sven. He quickly takes some of Zon’s potion so he can protect his friends. Thanks to the turtle soup he mixed in with the potion, and the ninja weapons he received as a gift, Jon mutates into… a teenage mutant ninja turtle! The mutated Jon makes short work of the mercenaries, knocking them all out. Zon then comes storming in and with a blast of magic he restores Jon. He admonishes Jon for changing the formula of his potion, as even the slightest change could bring about disaster. Jon whines that all he did was add some turtle soup for flavor, but Zon explains, “The combination of mutagen and turtles are reserved for future wizards. I believe their names will be Kevin Eastman and Peter Laird”. Tomgar and the others come to. Tomgar is furious and wants to kill the mercenaries, but sees they’re out cold. He wakes up Sigvald and demands to know who beat them up before he could have the chance. Sigvald says that it was Jon and runs away screaming, thinking Jon a monster. 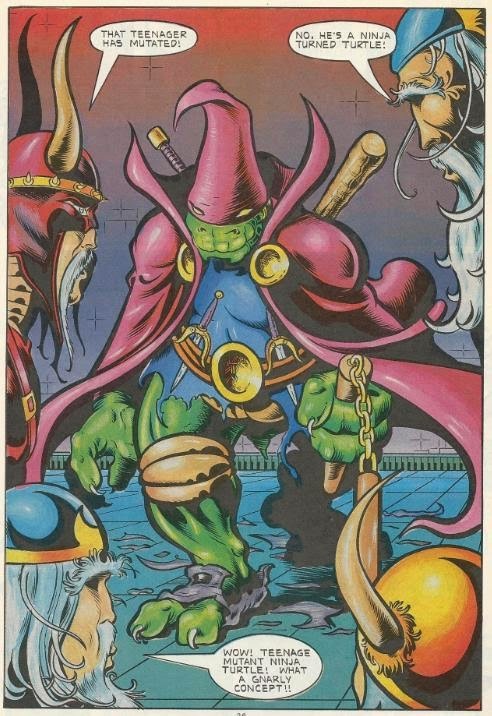 *Chronologically, the next crossover between the TMNT and the Viking Heroes will occur in Turtle Soup (Vol. 2) #4, in the story "Teenage Mutant Ninja Turtle". *Although the “teenage mutant ninja turtle” who appears in this issue is not one of THE Teenage Mutant Ninja Turtles, the indicia credits Eastman, Laird and Mirage Studios for giving permission to use the character likeness and the franchise name. 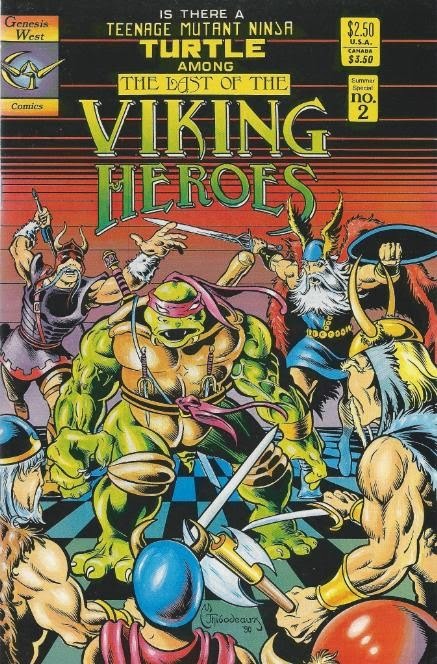 These Viking Heroes crossovers are the last of the weird little indie comic guest appearances by the TMNT that I own. I saved them for last because I just wasn’t that interested in reading them, much less reviewing them. But now that I’m at the bottom of the barrel I’m not exactly spoiled for choice. To my surprise, these comics have some GREAT artwork by Michael Thibodeaux. Reading up on the Viking Heroes series, it apparently attracted a lot of A-list guest contributors, such as Jack Kirby, John Byrne and George Perez. So back in the late ‘80s and early ‘90s, the Viking Heroes were a big deal. I guess. Their comic got cancelled after 12 issues and 3 specials, so you know. I'm not familiar with any of these characters, but that was surprisingly not an issue for me, as every member of the cast is a pastiche of some other fantasy comic adventurer. Tomgar might as well be Conan while his buddies, Erik and Sven, are less-than-subtle stand-ins for Mighty Thor supporting characters Fandral and Hogun (I presume there’s also a pastiche of Volstagg somewhere else in the series). So long as you can project those characters onto these knock-offs, you can pick up the book and go without any trouble. The inclusion of a “teenage mutant ninja turtle” struck me as being a last minute sales-boosting gimmick. Thibodeaux actually includes a look at the original cover by Marty Lasick as a bonus feature and guess what? It shows Jon transforming into a generic monster, NOT a ninja turtle. The ninja turtle gag was tacked on, for sure, but Thibodeaux manages to work the joke into the script and set it up so it feels more or less organic. 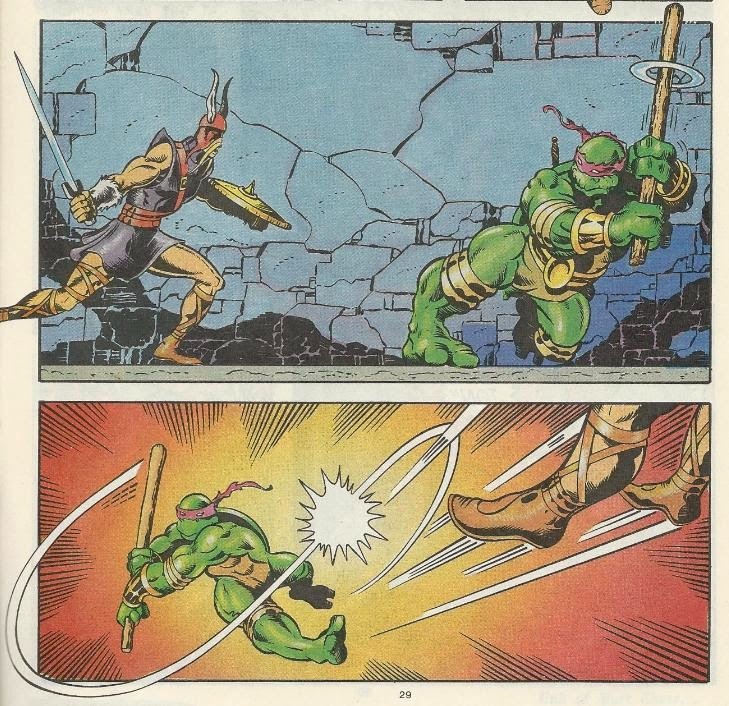 It’s a short moment and fans expecting an actual crossover with the REAL Teenage Mutant Ninja Turtles might walk away feeling they’ve been flimflammed by the cover. If it’s any consolation, there’ll be two more Viking Heroes/TMNT crossovers after this one and those will actually BE crossovers. So while this story isn’t exactly essential, and doesn’t actually include a real Ninja Turtle, Thibodeaux got permission from Eastman and Laird to use the name and likeness, so I guess in some way it “counts” as an official appearance.